Bushiroad will release the second wave of cards for its new trading card game Dragoborne: Rise to Supremacy on November 10, with the booster pack expansion Oath of Blood and the Reaper�s Gift trial deck. The new game, created by Mike Elliott (Thunderstone, Dice Masters) and featuring a combination of cards and dice, was released this summer (see �Bushiroad Unveils �Dragoborne� TCG�). The new cards in the upcoming Oath of Blood expansion will focus on new cross-color strategies as well as new core cards and dice manipulation abilities. Oath of Blood will be sold in eight-card booster packs. Each pack will include one or two R or higher rarity cards, and will be available in 20 pack display boxes. The entire set will include 120 cards, including some reprint cards, with the following rarities: 10 RR, 30 R, 30 U, and 50 C. In addition, five secret cards and parallel holo treatment cards will be randomly inserted in some packs. Each display will include five banner cards and five dice, and each 16-display carton pre-ordered by September 18 will come with four exclusive playmats. The new expansion will be supported by a special Oath of Blood Battlegrounds Tournament, scheduled for December. 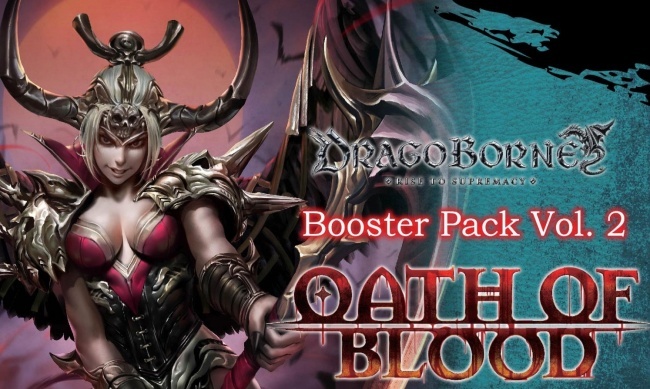 Retailers may also choose to participate in the Oath of Blood Sneak Preview event, which will occur the weekend of November 3 � 5, by ordering the Oath of Blood Sneak Preview Kit. Each kit will include 55 booster packs, 9 promo cards, and 2 premium rubber playmats. 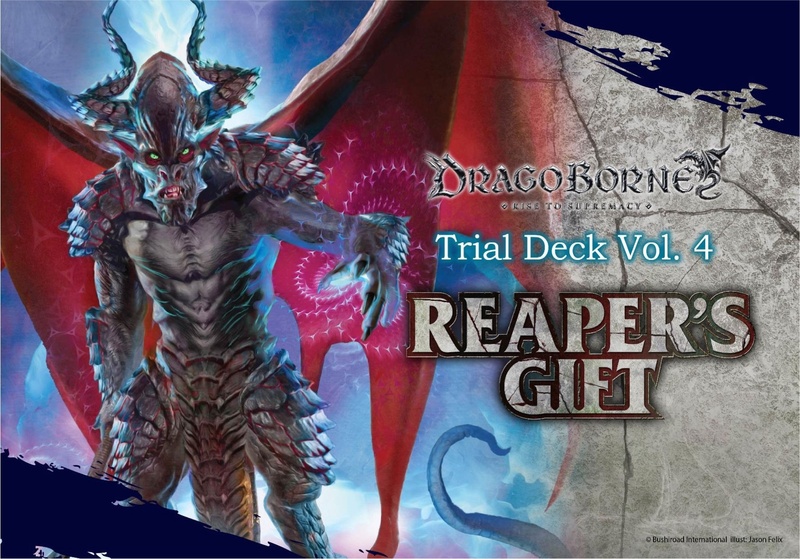 The new Reaper�s Gift trial deck offers players a quick way to jump into the game with new cards. The deck is built around mechanics that allow a player to return their destroyed creatures to play. The fixed deck includes 53 cards, 3 dice, and a paper playmat. The first run of Reaper�s Gift will also include a promo card, and some random decks will be upgraded with a holo parallel promo card instead. Reaper�s Gift decks will be packaged in six-deck display boxes. See the gallery below for a sneak peak at some of the new card art.